Critical Thinking: Is Snowden a Double Agent Sent To China By USA To Assess Their Hacking Capabilities? 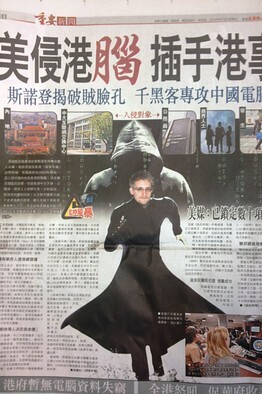 Is Snowden a Double Agent Sent To China By USA To Assess Their Hacking Capabilities? Edward Snowden, a former contractor for the U.S. National Security Agency, said he believed there had been more than 61,000 NSA hacking operations globally, including hundreds in Hong Kong and on the Chinese mainland. Those claims followed intelligence leaks Mr. Snowden made earlier this month to British newspaper the Guardian about U.S. surveillance, which prompted a political furor in the U.S. When it comes to Hong Kong politics, activists typically see Beijing as the main source of meddling in local affairs. Although the former British colony returned to mainland rule in 1997 and continues to operate with its own distinctive political systems and rule of law, pro-democracy activists fear Beijing is encroaching on the city. “Usually we hear from Western media that Chinese government is the one hacking,” said Oiwan Lam of Hong Kong In-media, which supports citizen journalism and is helping organize a rally Saturday in support of Mr. Snowden. “But apparently it’s a double standard, and when the U.S. hacks we are just in the dark,” said Ms. Lam. Supporters plan to march Saturday on Hong Kong’s government and the U.S. consulate. “What are we going to say to fight our battles now [against Chinese hacking] if the U.S. is doing the same?” she said. Mr. Lee said he already assumes his phone line is bugged and his office computers regularly the target of Chinese hackers. “At least if I know that there’s more than one government is spying on me I might feel safer, that way it’s not just the Chinese,” said Mr. Lee, who doesn’t expect the local movement supporting Mr. Snowden to gain much traction. “People think it’s really a matter between a U.S. citizen and his government. I doubt if that [issue] would raise too much enthusiasm from Hong Kong citizens,” he said. On Thursday, a spokeswoman for China’s Foreign Ministry said she had no information on Mr. Snowden’s claims and reiterated China’s stance that it is a victim rather than a perpetrator of hacking. The Chinese University in Hong Kong, which Mr. Snowden named as one target of American hacking and is home to the Hong Kong Internet Exchange—an Internet hub for the Asia-Pacific region—said it hadn’t detected any form of hacking on its network. Mr. Snowden has said that he wants to stay in Hong Kong, where he has been hiding out since May 20. He told the South China Morning Post that he ultimately plans to fight the U.S. in its courts. While Hong Kong has an extradition treaty with the U.S. government, if he chooses to apply for asylum or contest any potential extradition, Mr. Snowden could prolong his stay in Hong Kong for potentially years, lawyers say. Lawyer Ronny Tong said that Hong Kong could be a good base for Mr. Snowden if his goal is to get his message out, given its international media presence and independent judicial system. But he cautioned that top-notch legal representation in Hong Kong for Mr. Snowden will be expensive, particularly if it ends up involving a protracted yearslong battle. In such a case, Mr. Snowden could wind up with a bill for up to $650,000 in legal fees, Mr. Tong said. In addition to the attention Mr. Snowden’s allegations have received in Hong Kong and in state media, they’ve also been the object of some amusement—as well as outrage—on China’s voluble social media network. It's time to confront China's role in 9/11.